How many meetings with clients have you been to that were aimless, unstructured and poorly planned? If you're like most professionals, probably quite a few. The problem's particularly acute when it comes to business development meetings: your first few meetings with a potential client when you and they are trying to figure out whether you should work together. Make a mis-step here and the relationship is over before it's begun. Yet so many professionals try to “wing it” with little preparation and only vague objectives for the meeting such as “get to know each other” or “find out their issues”. Set up your meetings like this and you'll find that time after time your opportunities progress as far as the first or second meeting – but no further. From the client's perspective they simply can't afford to invest time in meetings with professionals which don't seem to be going anywhere and where they don't get value from the event itself. UK Copywriter Andy Maslen has a neat acronym to help writers approach sales copy. And the approach can be extended very effectively to client meetings too. It starts with Commit. At the end of reading the copy (or in our case, at the end of the meeting) what do we want the client to do – to commit to? For sales copy it could be to pick up the phone, fill in a form or click to buy. For a business development meeting it could be to agree to a follow-up meeting to discuss a specific topic in more detail, or to introduce the professional to a senior colleague. Then, you figure out what the client or potential client must Know and Feel for them to be comfortable making the commitment. 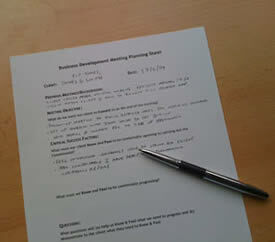 Every client meeting must have a clear objective of what you want to achieve from the meeting. And in particular, you must identify what you want them to actually do as a result. Because if they don't do anything differently as a result of the meeting then what was the point? Even if your goal is primarily to progress the relationship in some way – that progression needs to manifest itself in meaningful action. It may be something simple like providing more information, or making an introduction, or agreeing to a joint follow-up – but it needs to be something or the relationship really hasn't progressed. Make the objective realistic too. Your end goal may be for them to hire you – but that's unlikely to happen in your first meeting. Winning business in professional services is more like a courtship than a “one night stand”. A more realistic first meeting objective is to jointly agree on the key challenges the client faces that you could help with, to hold a follow-up meeting to explore these in more detail, for the client to do some homework and bring more details and data on the specific area, and for you to bring along some examples of similar work you've done for other clients. Having a clear meeting objective is important (and it's surprising how many professionals don't actually do it) – but on it's own it's not enough. You need to think through what it will take to achieve that objective in the meeting. That's where the K and the F come in. So if your objective is to get a follow-up meeting to discuss a specific area to work on together – what will the client need to Know and Feel for them to agree to that? Know is about facts. Perhaps they need to know the areas you work in, the types of clients you've worked with before, or that you're a real expert in your field. That will begin to give them the confidence that you have the skills to work on their problem. Feel is trickier – but often more important. What do they need to feel to commit to your objective. Perhaps they need to feel that you understand them, that you're “on their side”. Perhaps they need to feel that you've really listened to them, or that you're a person they can trust. How do you get your client to Know what they need to know and Feel what they need to feel? That's the art of business development. Firstly, recognise that you certainly won't effectively get across the right knowledge and particularly feelings through a long presentation about you and your company. That might get across some of the right knowledge – but it will create entirely the wrong feelings. Your client will feel that you're more interested in yourself than them – that you don't listen – and that meetings with you are going to be deathly dull. One way to get across your knowledge and experience that doesn't come across as dull and self-promotional is to use short stories and anecdotes of similar client situations. I go into more details on this in my post on Selling With Stories. Most often, the route to both establishing the things the client needs to know, and in getting them to feel the right way about you is to ask smart questions. Being able to ask the right questions that really home in on tough issues and the underlying causes will establish your expertise far more than any claims you might make about it, qualifications you might have or awards you might have won. And by empathising with the responses and occasionally mentioning similar situations you've been in, you'll establish the right feeling of “he understands me” and “he's been in this situation before – he'll know what to do to help”. So the bulk of your preparation and structuring of the agenda for the meeting should be on the questions you need to ask to both find out what you need to know – but more importantly, to help the client know and feel the things you identified were critical for them to then be comfortable agreeing to the objective. And finally, of course, you must close by asking for that follow-up meeting, or the introduction you were looking for, or at the end of a series of meetings – actually asking for the business. Sounds obvious: but so many professionals fail to do it. Fear of rejection kicks in and they close weakly without making a clear request for the action they're looking for. And so it doesn't happen. But if you've planned and prepared correctly. If you've structured the meeting to cover all the bases necessary to help the client know and feel the right things – then they should be perfectly comfortable committing to the desired action.